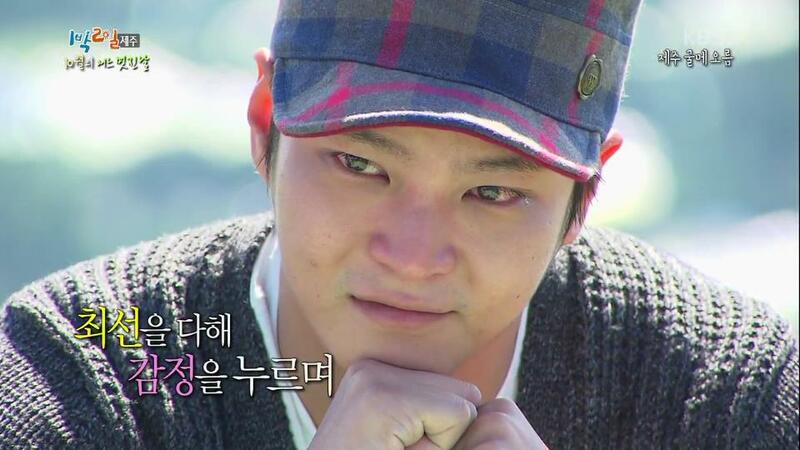 Ever since I heard about Joowon leaving 1N2D, I waited for this episode. I didn’t know if I could recap it through my tears, but I wanted to try for his sake. I expected a lot of crying tonight, but I didn’t expect so much heartache. Leave it to Joowon to make even farewells memorable and poignant. He wasn’t just the maknae on this team, he was the one who showed a lot of effort to improve each week and do his best. Despite his busy schedule filming dramas and movies, he made it work and stuck with us week after week. If any of these hyungs didn’t have younger brothers in real life, they fulfilled their dream of having one around with Joowon. He was the best one too – loveable, dependable, loyal, and full of respect and adoration. They couldn’t have asked for a better maknae. That’s probably why they decided not to search for a new one cuz once he became a part of their lives, he became irreplaceable in their hearts. By not getting another member, this was their way of showing how much Joowon meant to them. He didn’t need twenty months for us to fall in love with him cuz he already had most of our hearts through his acting, but it took that long for the rest of these hyungs to store up all the precious memories they shared with their beloved maknae so that they can cherish them for the rest of their lives. 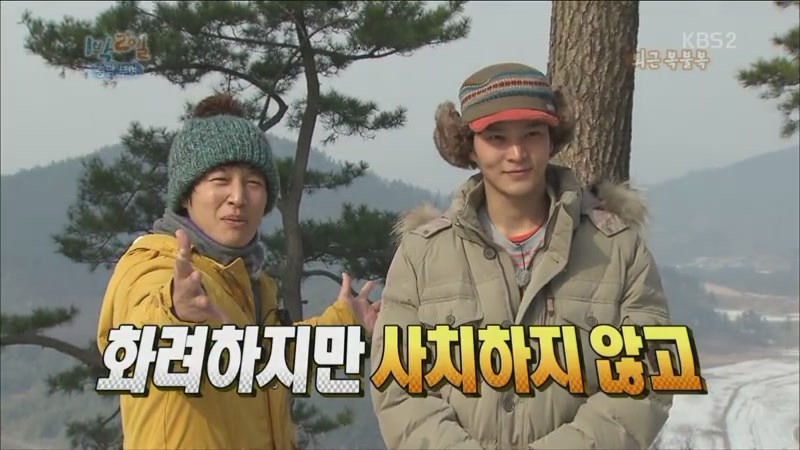 Thank you Joowon for making 1n2d a little more special with each new memory. Our best wishes and all our love go with you. It must have been nice to be the center of attention for an entire trip. When CKH talked about the memories she made on 1n2d, it reminded me of all the other people before her who went on these trips. No matter where they go or what they do, the consensus of every guest on the show is they have a great time and walk away with unforgettable moments. I doubt bumping noses with JM and seeing him in a towel will be the highlight of her trip, but I bet everything else was – especially getting to spend some extra time with her favorite adorable dongsang. It’s been one year since these guys came together. Instead of stepping into the giant footprints left by season one, these guys decided to take their own path and leave their own unique mark on a beloved variety show. Looking back on their trips, there were lots of laughter, suffering when they had to starve or sleep outdoors, struggling to get through quizzes with a shred of dignity and falling short, learning about the country, culture, and each other, but mostly we watched seven men become a family. They counted on one another, they shared the good and the bad, they bonded closer than brothers, and now they have gained an audience of their own. Let’s just hope their viewers continue to increase as they set out to bring us more laughter in the coming months and years. Recap for March 24th episode will be added to a new 1n2d post on Tues night. I feel so bad for JW cuz he lacks confidence in these games and quizzes. It’s so hard to hear him being so self-deprecating in real life when his characters are so confident and strong minded. I wish he could learn a thing or two from them and just realize confidence breeds positivity. If you ask me he just needs a pretty cheerleader on his side. Just when I was thinking when are they going to have some female guests on this show, the preview showed they brought on some Olympic athletes for next week. Some are female, but I don’t think the heavy weight contender is going to be all that girly. It’s almost time to bid 2012 goodbye so 1n2d has something special for us tonight so I made a brand new post. Plus my end of the year review post will make it 360 posts so far for this little blog. It didnt take very long for us to fall in love with season two’s cast so I hope we will never have to see a third season in the future. Praying for no cast changes in 2013 and hoping for a scene where SK and JW sing together. That would be a dream come true. Best wishes for these guys in the new year and to all my readers and 1n2d fans, thanks for all the support and encouragement over the last two years. Christmas perfection … seeing stars circling over my head and feeling faint cuz of these photos, but still giddy. No matter how much these guests complained about the rain and cold, how much do you want to bet they wouldn’t exchange this experience for anything. Not many old singers get to suffer through these conditions and end up feeling so close with 7 other guys so quickly. The hardships they endured are fleeting, but they will soon learn that the memory of this time together with the other members will last – hopefully as long as those songs they composed. As Jong said, “there is a warm feeling about 1n2d.” Amen to that. None of us have ever been on these trips, but we get to vicariously experience their fun with them. If we have this much fun just watching, can you imagine how great they must feel to get the opportunity to take part in person. I hope every minute of this trip is cemented in their hearts so that if the chance ever comes again, they will gladly jump ahead of the line to come back.